This is such a simple dessert with few ingredients.. It can be eaten by itself or served with ice cream. 1. Mix together the flour, sugar & butter using a pastry blender until it resembles crumbs. 2. Brush the oven proof dish with butter. 3. Slice the apples finely and spread them in a single layer in the dish. 4. Sprinkle the cinnamon on top of them. 5. Spread the mix on top of the slices evenly. 6. Pre-heat the oven and bake it until the crust is crisp. It takes about 22 - 25 minutes. Note: The time may vary a little depending on the oven and the quantity. Beeha / bea ( lotus stem / kamal kakdi ) is one of the delicacy in the Sindhi Cuisine. We have a variety of preparations with this vegetable like daag wari bhaji, seyala bhaji, palak mei beeha, beeha ji tikki, chutney wara beeha etc etc... When in season we add it to almost all the curries and meats.Cleaning this is the toughest part because it is covered with mud and kept fresh by sprinkling water over it. We have to wash it very well before using. Scrape the outer skin and cut into slanting slices. This way it will not be very hairy when you bite it. 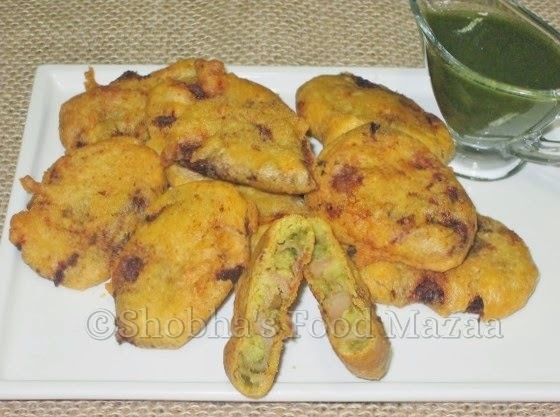 Today's recipe is pakoras / fritters made with the boiled lotus stem slices. 1. Boil the lotus stem slices in a pressure cooker adding a little salt. Drain and set aside. 2. Mix all the dry spice powders and sprinkle on the slices. 3. Make a smooth and thick batter with besan, salt and baking soda. 4. Dip the slices in the batter and fry them until half done. Serve with any chutney or sauce. Note: You can also stir-fry them with mint chutney instead of the dry masalas and make pakoras in the same way. 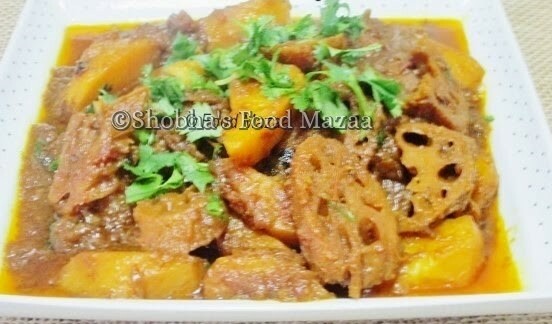 Beeha / bea ( lotus stem / kamal kakdi ) is one of the delicacy in the Sindhi Cuisine. We have a variety of preparations with this vegetable like daag wari bhaji, seyala bhaji, palak mei beeha, beeha ji tikki, beeha ja pakora. Thin boiled slices can also be relished with mint chutney. When in season we add it to almost all the curries and meats.Cleaning this is the toughest part because it is covered with mud and kept fresh by sprinkling water over it. We have to wash it very well before using. Scrape the outer skin and cut into slanting slices. This way it will not be very hairy when you bite it. 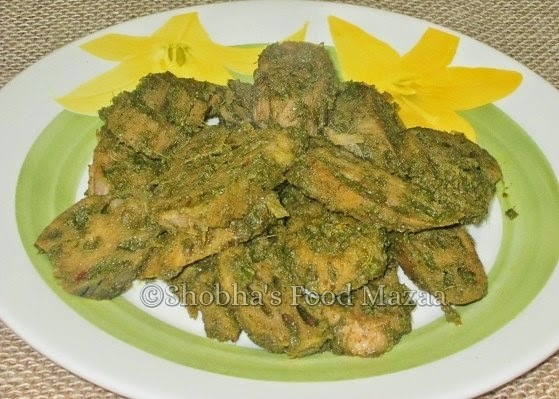 Today's recipe is a healthy and chatpata snack made with boiled lotus stem and mint chutney. Vinegar or lime juice .. 1 tbsp. 1. Scrape the lotus stem and cut the slices slanting. Boil adding a little salt, preferably in a pressure cooker. Drain and set aside. 2. In a pan, heat the oil and add 3-4 tbsps of mint chutney. Saute and add the mentioned spice powders. 3. Toss the boiled lotus stem slices until they are well coated with the chutney. Serve it as a snack, hot or cold. 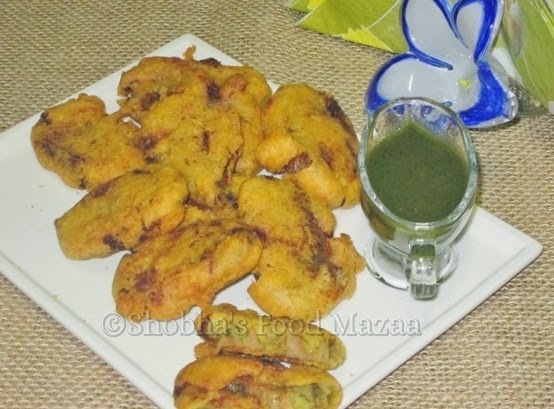 Note: You can also dip these in the besan batter and fry pakoras. This is a very popular chutney of Maharashtra.. It is usually served with vada pav. It tastes good with puris and bhakri as well. Red chilli Powder ....2-3 tbsp. Dry coconut grated .... 1 tbsp. Cumin powder ......... 1 tsp. Turmeric powder .... 1/2 tsp. In a pan heat the oil and saute the onion till water dries, add garlic... stir fry and add all the other ingredients. The consistency has to be dry like crumbs. These kachories brought back childhood memories. Mom would make all these yummy snacks to carry for the train journey and how we relished them. Knead into a soft dough adding water. Set aside. 1.Boil the potatoes, peel them and cut into small pieces. 2. In a pan heat a little oil and add the potatoes and spice powders. 3. Add salt and coriander leaves and mix well mashing with the spoon. 5. Now roll out a small quantity of dough and stuff it with the aloo filling. 6. Seal the edges into a bundle and roll it lightly. 7. Deep fry the kachories until crisp. Serve hot with sweet tamarind chutney. Marinated jumbo prawns wrapped in spring roll wrappers and deep fried... 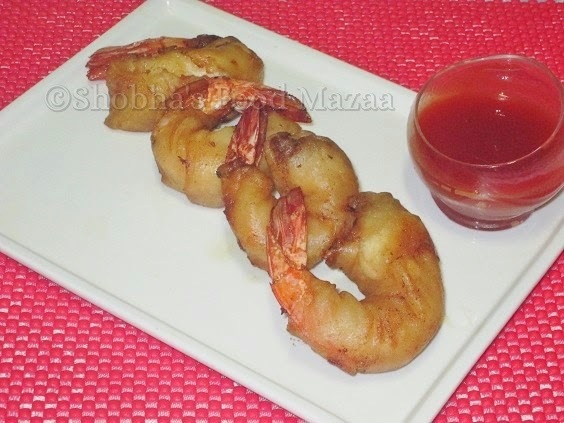 Very simple and delicious treat for sea food lovers.. I had eaten these in a sea food restaurant in Houston and liked them a lot. 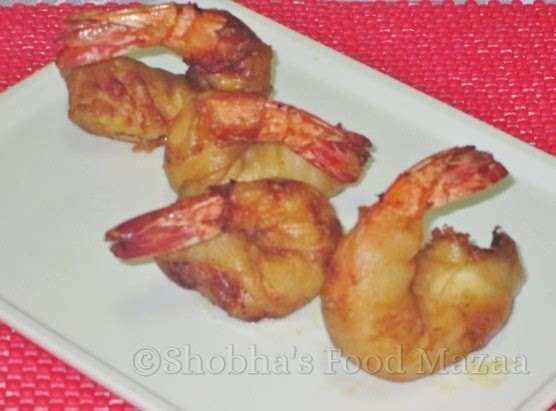 I gave it a try making them at home and they tasted exactly the same..Those of you who love prawns are surely going to like them. 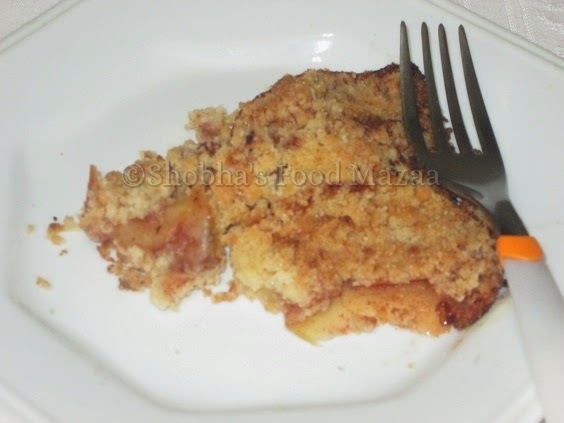 Dilute the maida with water and cook it in a pan whisking all the time to avoid lumps until it is thick. 1. Clean the prawns and leave the tails intact. 3. Drain the liquid out completely. 4. 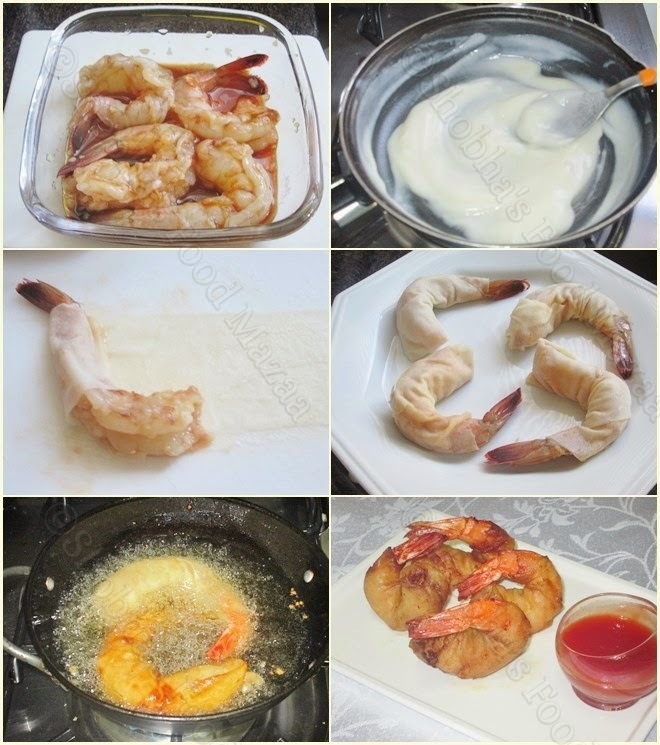 Take a strip of 3 inch wide and wrap it around the prawn sealing it with the maida paste. 5. Heat oil and deep fry the prawn spring rolls to a golden colour until crisp on medium flame first and reducing it to low so that the prawns get cooked. Vadakari is a traditional South Indian side dish, which is often made from the left-over vadas / masala vadas. I have tasted it but never tried making . Soak dal for 2-3 hours. Grind coarsely adding all the ingredients. Fry the vadas and set aside. 1.In a pan heat a little oil and add the tempering ingredients. 2. When they crackle, add the onion and saute until golden brown in colour. 3. Add the tomatoes, salt and spice powders.Saute until the tomatoes are cooked. 4. Add the coconut milk and give one boil. 5. When you are ready to serve, put the vada pieces and boil once. 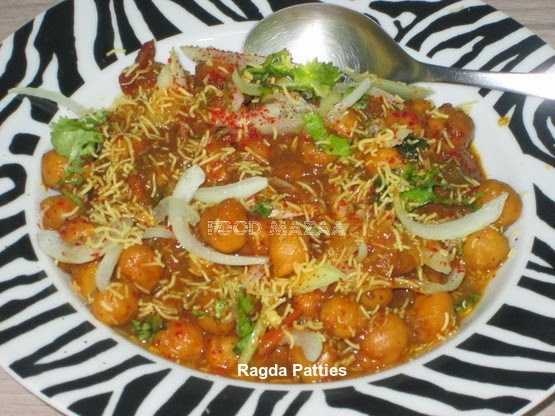 Ragda Patties is a very popular chaat item .Aloo Tikkies topped with spicy ragda and chutneys, onion and thin sev.. It is usually made with vatanas .. But some people also make it with chana (chick peas ) . I have made with chick peas since we don't get vatanas in Brazil. 1. Boil the potatoes and mash them. 2. Mix all the ingredients and make cutlets. 3. Pan-fry them when you are ready to eat. 1. Soak the chana preferably over-night. Boil them adding salt. 2. Heat oil in a pan and fry the onion to golden brown colour. 3. Add the ginger garlic paste and half cup water. Simmer to cook. 4. Grind the onions to a paste. 5. Add all the spice powders, salt and tamarind. Add water and the boiled chana. 6. Simmer until the chana is soft and keep the gravy according to your preference. Sev ... I have replaced them with potato sticks as we don't get them here. 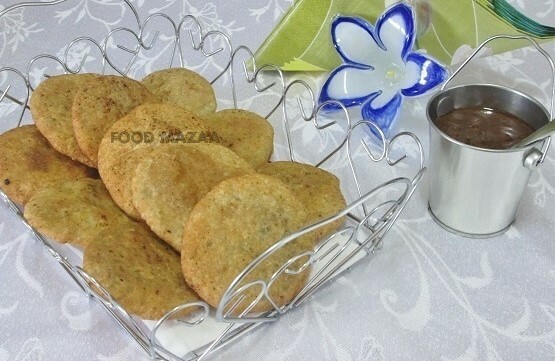 1.Place the pan-fried tikkis / cutlets in a deep plate. 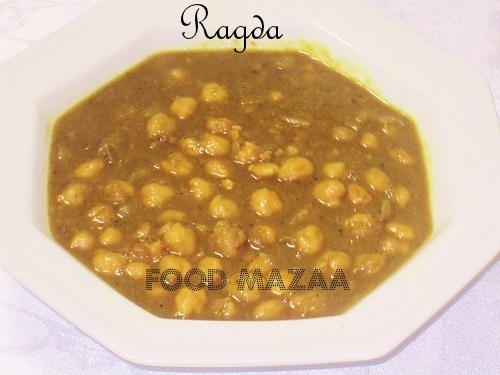 2.Spread the prepared ragda / chana on them. 3.Spoon a little chutney and garnish with fine sev and coriander leaves. 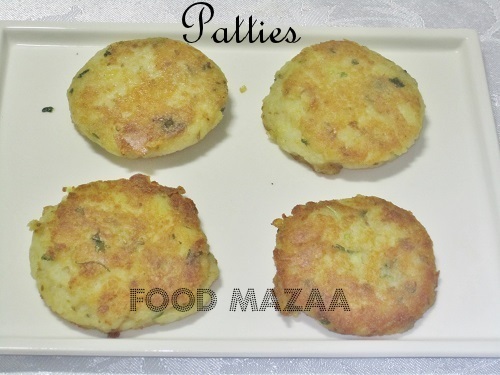 Enjoy the chatpata ragda patties. Pickles and chutneys make our meal complete. 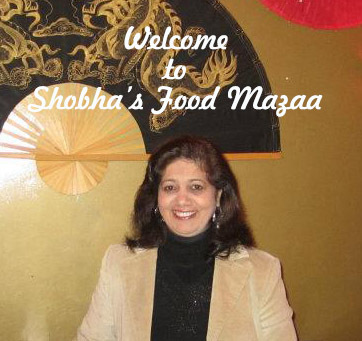 We have varieties of them in the Indian Cuisine and there is no end to new innovations. I made this tangy spinach and onion chutney. Tastes really good. 1. Heat oil in a pan. Add the cumin seeds. Don't let them become too brown. 2. Add the asafoetida, onion and garlic. Saute for a minute or two. 3. Now tip in the spinach, coriander leaves and green chillies. 5. Mix and simmer for a while, stirring it occasionally. 6. Let it cool. Grind it in a mixer. It stays good for a longer time if you add more oil to it. 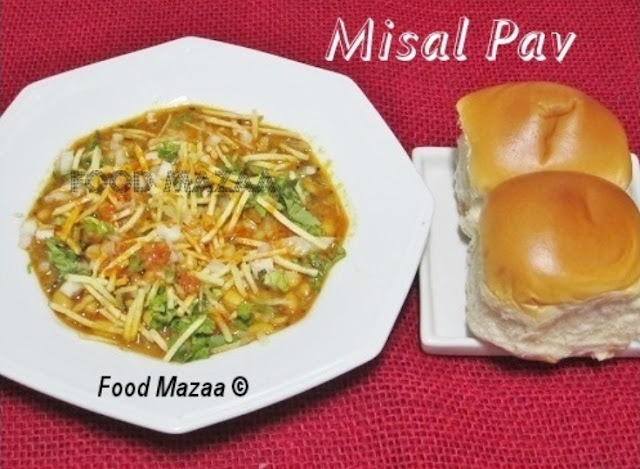 Misal pav is a popular street food of Mumbai.. 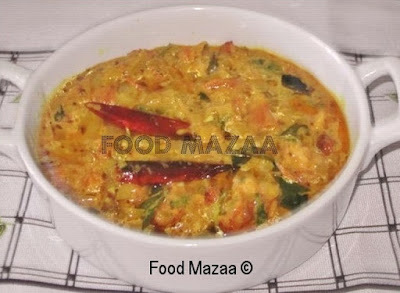 In the interiors of Maharashtra it is made really hot and spicy with a variation in masalas. Kolhapuri Misal Pav is very famous and the most spiciest. Misal in its original form is prepared using onion, ginger, garlic and other spices. 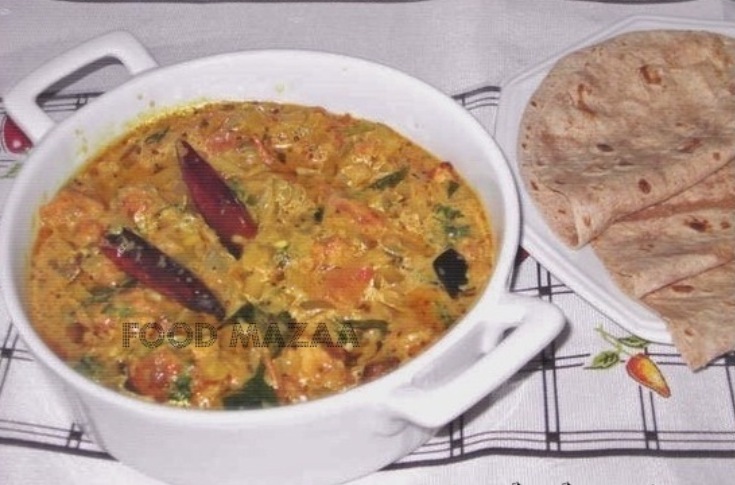 It has two parts, a thick curry of matki called "Usal" which has less water content and a watery and spicy "cut" or "bite". Usually people mix these two according to their taste and requirement. 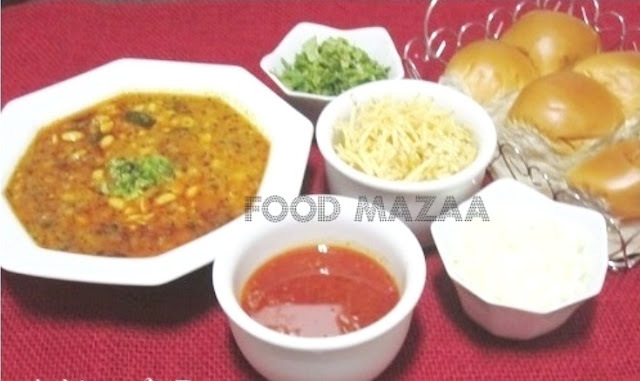 In most restaurants which serve misal-pav, usal and cut are served together. Cool buttermilk / chaas / lassi is usually served along with this dish. Its sweeter version is famously known as Brahman Misal. 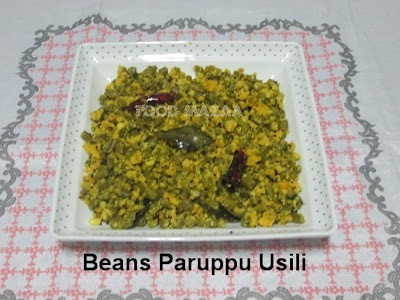 Some people also make USAL with fresh peas, dry white peas, kala chana .. I am using dry soya beans. We do not get the Indian lentils in Brazil. Matki (moth beans) ... 1 cup (soaked overnight) I used Soya instead. Boil them with salt, drain and set aside. They should be cooked well but not mushy. In a pan heat oil and add the mustard seeds and asafoetida. When they crackle, add the curry leaves and reduce the flame. Add all the dry spice powders and the wet masala paste. 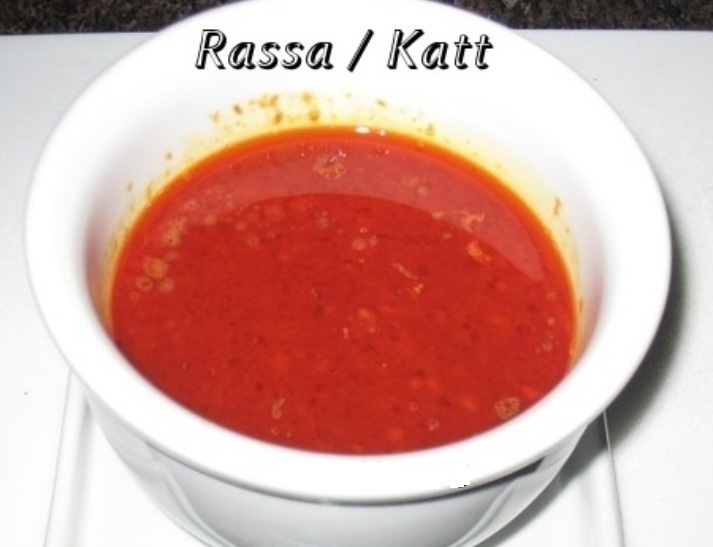 ( Set aside little for Rassa / Katt (spicy thin curry). Saute and add the boiled matki or any beans that you are using. Add enough water ( as per your preference of the consistency of the gravy) Kolhapuri masala, sugar or jaggery. Check the salt.Cook for a minute so that the spices are incorporated with the matki beans. In case you don't have Kolhapuri Masala you can use Garam Masala. In a pan, heat oil and add the mustard seeds and asafoetida. When the seeds crackle, reduce the flame and add the dry spice powders and the wet masala. saute and add the tamarind pulp and salt. Add enough water for the gravy and boil for a few minutes. Finely chopped onion and coriander leaves. I have replaced the Farsan with Thin Potato sticks as we don't get it here. In a deep bowl take some USAL spread some onion and coriander, pour a little RASSA and garnish with Farsan or Sev. Serve immediately with Pav Bread. This is a very popular street food of Brazil. Pasta dough is stuffed with various fillings, veg and non veg. and deep fried. 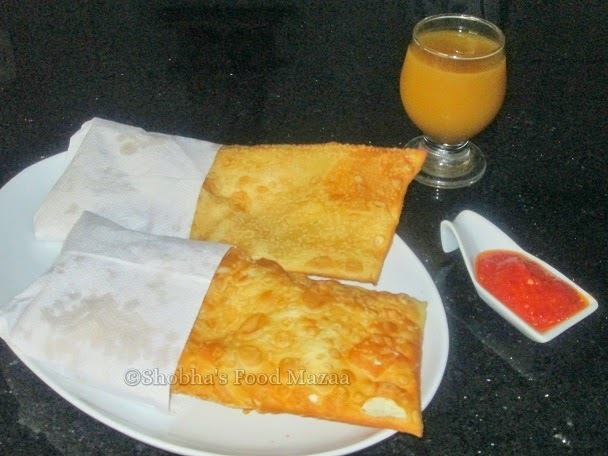 Sugarcane juice is served as an accompaniment with this snack. This dough is available here in the supermarkets. It is the same recipe as pasta dough so you can easily try it out at home too..
Knead the dough and rest it for 1 hour wrapped in a plastic paper. 1. Roll out the dough into rectangular shape. 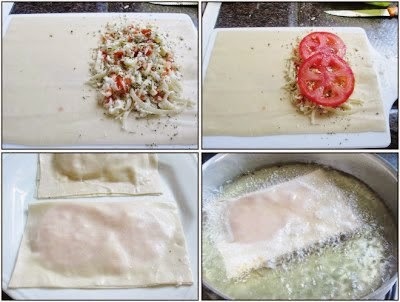 2.Place the filling on one half of the rolled dough, wet the edges and fold the other half over it pressenf the edges with your fingers to seal them. 3. Deep fry and serve them immediately. This is a Gujrati delicacy which can be made in varied flavours. 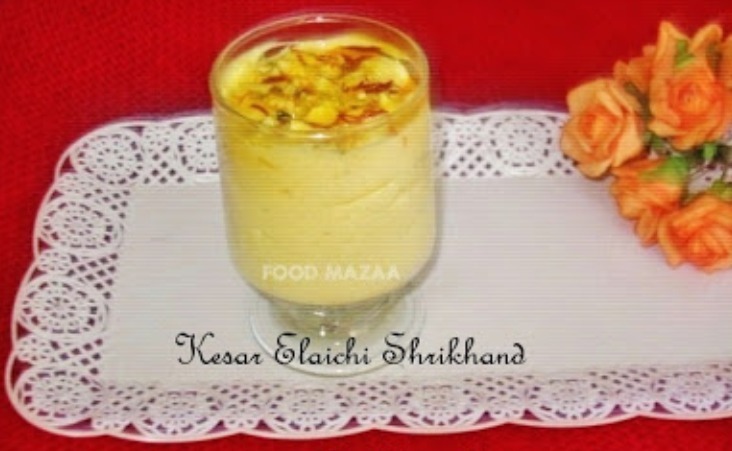 My personal favourite is kesar elaichi. As kids we used to relish it with tiny poories that mom made for us. 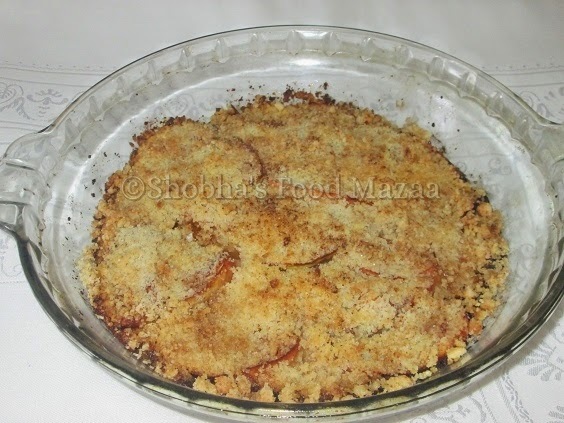 It is such a simple dessert but when I tried my hand at it for the first time after I got married, it never turned out as creamy as mom's. I knew I was going wrong somewhere. The tip I got from her was to hang the curd for at least 8 hours, preferably overnight to get the thick hung curd.. Make sure that if you are making any other flavours like mango, strawberry the pulp has to be very thick and not watery. Icing sugar ....... 3-4 tbsps. Kesar / saffron ... a generous pinch soaked in a little warm milk. Unsalted and sliced pistachio nuts .. 2-3 for garnishing. 1. Hang the yogurt in a muslin cloth for minimum 8 hours or over night to make the hung curd. 2. Take the thick hung curd in a bowl and add the cardamom powder and saffron. 3. Whisk it and add sugar little by little while doing this. 4. Spoon it into the serving bowl and garnish with sliced pistachios and a little saffron. This month I am paired with Archana Ramachandran in the Potluck Party hosted by Jagruti. 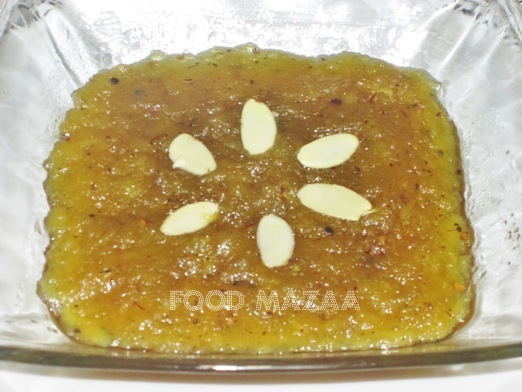 This is a fruity sweet and tangy halwa made with apples and kiwis from her blog Tangy Minds Very easy to make and definitely a kid's delight ! 1. Peel and grate the apples. 2. Peel the kiwis and remove the seedy part (core). Grind them in a mixie. 3. Heat 2 tbsps ghee and saute the fruits together until the liquid dries up. 4. Add the sugar and cardamom powder and keep stirring until the halwa is thick and gets a shine. You can serve it in a dish or set it in a mould and turn it upside down and then garnish with nuts. Beeha / bea ( lotus stem / kamal kakdi ) is one of the delicacy in the Sindhi Cuisine. We have a variety of preparations with this vegetable like daag wari bhaji, seyala bhaji, palak mei beeha, beeha ji tikki, beeha ja pakora. Thin boiled slices can also be relished with mint chutney. When in season we add it to almost all the curries and meats.Cleaning this is the toughest part because it is covered with mud and kept fresh by sprinkling water over it. We have to wash it very well before using. Scrape the outer skin and cut into slanting slices. This way it will not be very hairy when you bite it. 1. Wash and scrape the outer skin of the lotus stem. Cut into thin slanting slices. 2. Boil them adding a little salt, preferably in a pressure cooker. 3. Peel the potatoes and cut them into chunks. 4. Heat oil in a pan and fry the onion to brown colour. Add ginger, garlic, tomato and green chilli with one cup water and simmer to cook. 5. Mash it using a masher or hand grinder. 6. Tip in the potatoes, salt and the spice powders. Bhuno it for a minute and add enough water to cook the potatoes. 7. 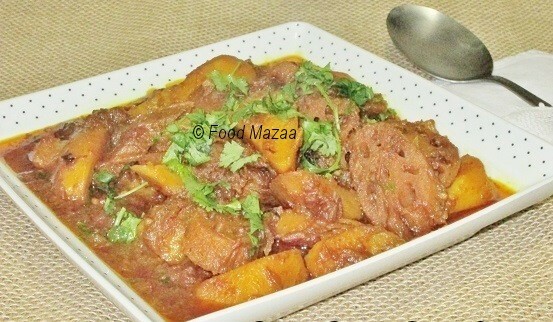 When the potatoes are half done, add the boiled lotus stem slices and the coriander leaves. 8. Simmer until done. The quantity of water depends on the gravy of your preference. 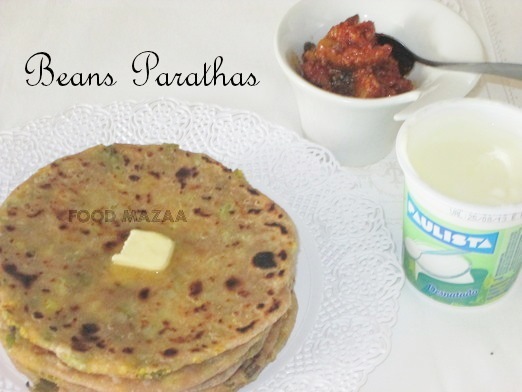 Paratha is one such dish where we can use any filling and relish it with pickle and dahi. I had some beans paruppu usili left over and used it as a stuffing. The parathas tasted awesome. Oil .... 2 tbsps for the dough and more for making parathas. Mix the salt and oil with the flour and knead to a soft dough. Cut the beans very finely, boil it with salt. Drain the water. Add roasted chana dal powder ( Putani powder) and dry spice powders. Mix well and use as a stuffing for the parathas. Roll out the parathas with the filling and roast them on the hot griddle spooning a little oil or ghee to make them crisp. Vadis are sun dried lentil cakes like mangodis. 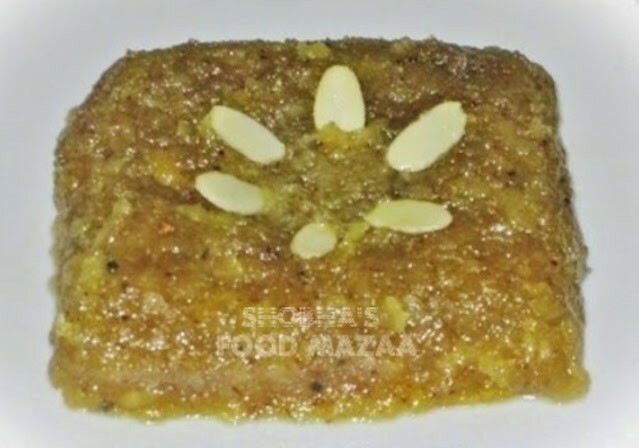 Sindhi vadis are made with urad dal. We can use them to make curries along with other vegetables. 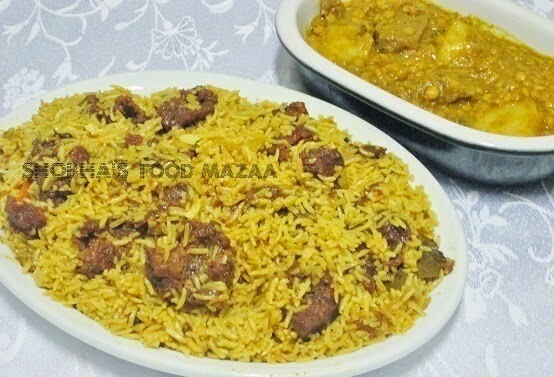 Varyun jo Pulao is a very traditional Sindhi rice preparation. with urad dal vadis. 1. Heat about 2 tbsps oil in a pan. Add the sliced onions and fry until golden brown in colour. 2. Add the ginger garlic, green chillies and tomato with one cup water and simmer to cook. 3. Mash the cooked onions using a masher or hand grinder. 4. In a pressure cooker, heat 2 tbsps of oil saute the urad vadis turning them to fry uniformly. 5. Add half the quantity of the fried and mashed onion paste. Add the turmeric powder, red chilli powder, coriander powder and salt. Add 2 cups water and pressure cook the vadis. These vadis take longer to cook so I use the pressure cooker. 6. Let out the steam and open to check if the vadis are done. 7. Wash and soak the rice. 8. In a heavy bottomed pan heat 2 tbsps oil and add the whole spices mentioned in the list. If you want you can crush them lightly before adding. 9. Add the remaining onion paste and saute. Add salt. 10. If there is any gravy in the vadis then remove the vadis and use the gravy also for the pulao. 12. add the rice to it and once it starts to boil, reduce the flame and cook until 3/4 th dome. 13. Now carefully mix the vadis. 14. Heat a liitle oil. Sprinkle the kummel seeds on top of the rice and pour hot oil over it. 15. Keep it for dum with the lid covered tightly preferably the pot should be kept on a griddle (low flame) for 3-5 minutes. Serve it carefully not breaking up the vadis too much. 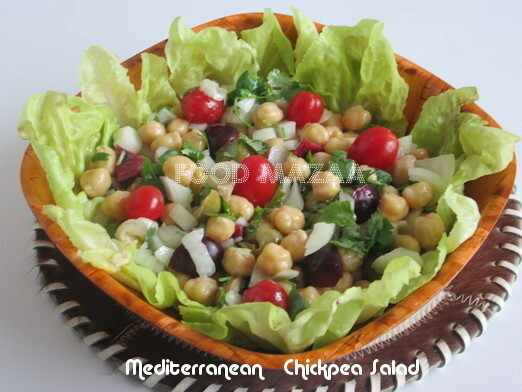 My dish for this month's potluck party hosted by Jagruti is healthy Mediterranean Salad. All the ingredients are easily available and it makes a light meal by itself. 1. Mix all the salad ingredients. 2. In a bowl whisk together the dressing ingredients. 3. Pour the dressing in the salad ingredients and toss them well. Refrigerate and serve it chilled. 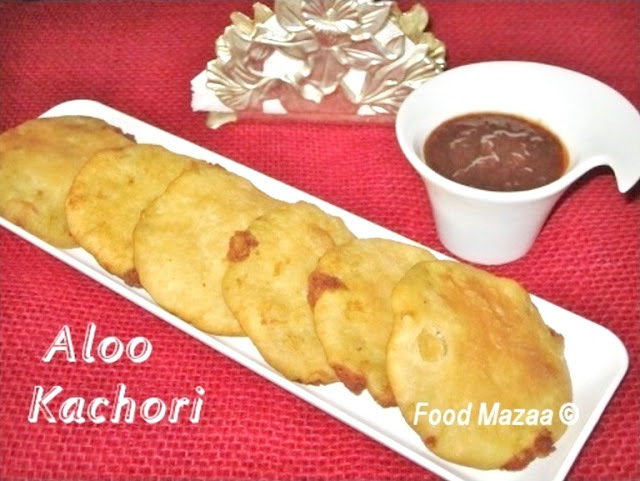 Kachori is a famous snack of North India. 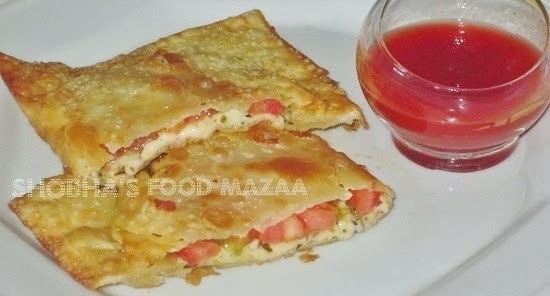 It is deep fried, crispy and stuffed with spicy filling of dal and roasted spice powders. You can use moong , masoor or urad dal. I keep trying out different variations. The dry roasted spices have to be taken in a large quantity. If cooked dal is 1/2 cup the masala should be 1/4 cup. 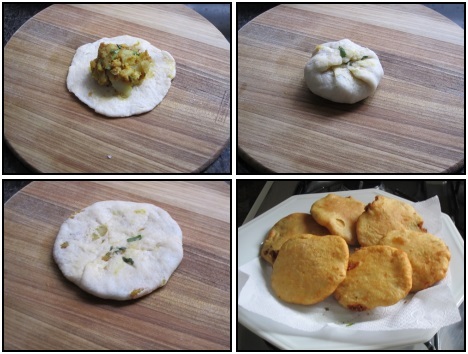 The water content is not much in the filling so the kachoris stay good for a few days. 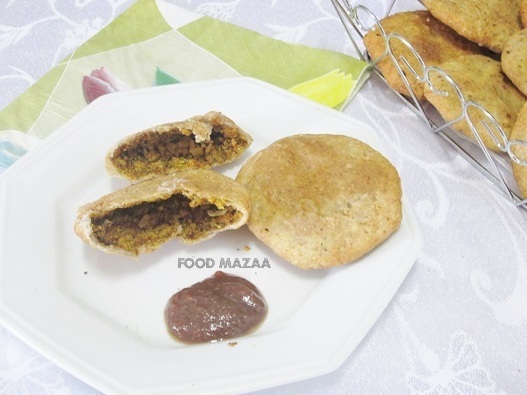 We have the sweet version of this in Rajasthan called Mawa Kachoris. 1. Soak urad dal for 2-3 hours. Drain the water and cook it with very little water. Dal has to be like half cooked, grains separate and not mushy. 2. Dry roast the Saunf, cumin seeds, coriander seeds, cardamoms, cloves, cinnamon stick and dry red chillies. Grind them coarsely. 5. Roll out small puris, spoon the dal filling and seal the edges making a bundle. Flatten it and roll it very lightly taking care that it does not open up. 6. Drop them into medium hot oil. Spoon the oil on top of the kachoris to puff them up. Reduce the gas and fry the kachoris on a low flame to make them crisp. Note: The quantity of the chillies can be adjusted according to your liking. 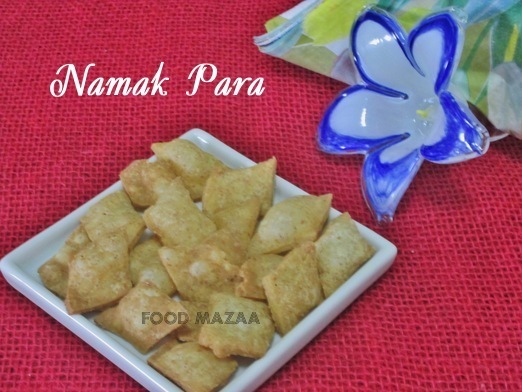 Namak para is a simple snack made from all purpose flour flavoured with carom or cumin seeds. It is perfect to munch at tea time. 1. Mix ghee or oil, salt and carom seeds (ajwain). 2. Knead to a medium soft dough and leave it covered for half an hour to one hour. 3. Heat oil in a kadai / pan and roll out a small portion of the dough. 4. Cut into strips, squares or diamond shape. 5. Drop them into the oil and fry on medium and low flame (changing it from time to time) until they are crisp. 6. Drain out on a paper towel. 7. Cool them and store in air tight container. 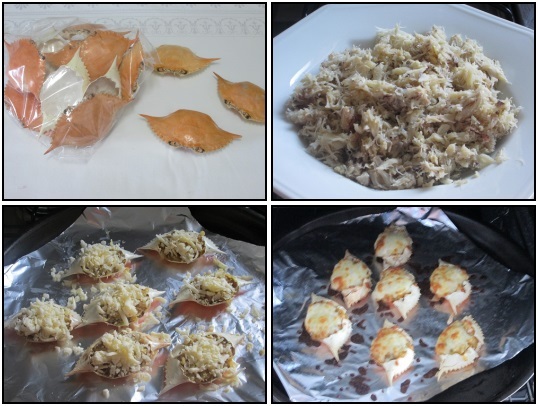 Here is another popular Brazilian snack made with crab meat. Delicious one ! 1. Wash the crab meat using a strainer. 2. In a pan heat oil and saute the garlic and onion until translucent. 3. Tip in the crab meat and stir-fry for a minute. 4. Add the rest of the ingredients except cheese. 5. 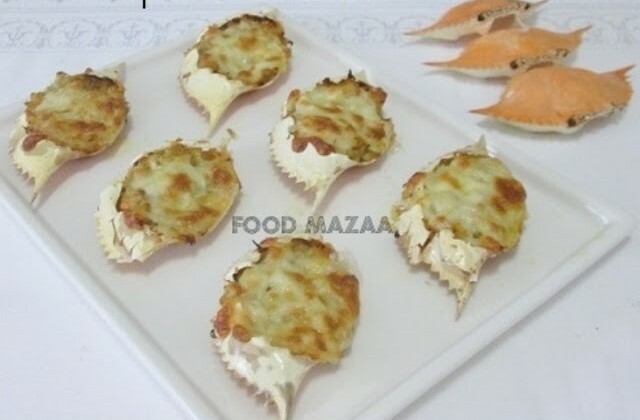 Fill the meat in the crab shells and top it with grated cheese. 6. Bake in the pre-heated oven until the cheese melts.